….Had the priviledge of running 1/2 mile or so with Ron Hill!! – He still holds the FHA course record – its been intact for 30+ years! He’s now 70 and told me this was his last ever half, but would continue with the fells as they take less of a toll! As he finally raced ahead of me I was left wondering what drives him on still – sharing the field with the likes of me! I think I know what drives him on – we all have it – its the experience of taking part, sometimes the enjoyment comes after the pain but there is a buzz with every race (& training session) even if the times are slower! 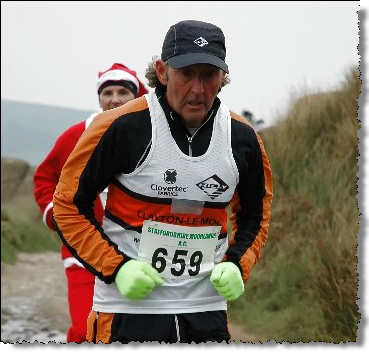 Its great to do club counters but running also gives us the options of running all over the country/world (LAMM two weekend ago, Saunders the w/e after next, 10 marathons in 7 cities in 7 countries etc etc) and I am proud each time to run in my Helsby vest. For all of us the further afield we run the more we advertise our club. So very well done to Jackie who had also competed in the Tattenhall Tough Team Challenge on Friday Night!